Top exotic African hardwoods for exterior applications. 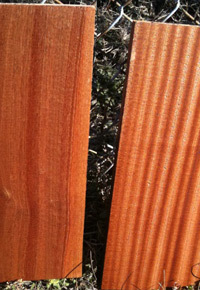 Two of the top exotic hardwoods used for exterior applications are Utile (or Sipo) and Sapele. Both woods hail from Africa and are part of the Meliceae botanical family. 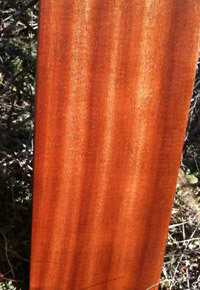 Both Utile and Sapele woods are stable and attractive exterior species with ribbon-like striping. Both are often used for exterior trim as well as door and window applications, and Sapele is a popular choice for plywood veneer. As far as distinctive characteristics that separate Utile from Sapele, Sapele is known for its parallel ribbon striping that is most obvious in quartersawn wood typically used for plywood veneer. While Utile’s appearance is more subtle, it distinguishes itself by its larger pore structure which boasts extremely dark lines between growth rings. While those distinctions are obvious in Utile’s flatsawn form, quartersawn Utile has ribbon-like striping that’s wider and less parallel than those of Sapele. Both Sapele and Utile grow in canopy forests, all-but eliminating the low-hanging branches that typically create knots and irregular grains. These large, hearty trees have thin sapwood layers, and the interlocked spiral-patterned grain is similar to the double helix of the DNA structure. This interesting pattern can produce tear out during planning — although not as easily as African Mahogany. Because Sapele is slightly harder than Maple, Utile is softer, making it easier on tools. Many woodworkers agree that the beauty produced by the interlocking grain in some ways outweighs the difficulties that come with it. The deep red, consistent coloring and straight grain combine to produce stunning figuring, particularly in quartersawn cuts of Sapele or Utile. While thick cuts (such as 8/4, 10/4, or 12/4) are readily available, African mills tend to avoid thinner cuts such as 4/4, as well as wide widths or extremely long boards. While African mills typically have ripped boards down to 6-8” widths in the past, they have changed in recent years due to requests from many importers to leave the boards 12-15” wide instead. While Genuine Mahogany has long been a favorite of furniture makers, its continually climbing prices and decreasing availability make it less popular than it once was. Some furniture makers actually find Utile preferable to Genuine Mahogany as far as appearance, durability, and workability. In fact, some people think that the 18th century furniture often thought to have been made from Mahogany was actually made from Utile wood. 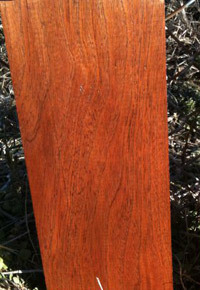 Sapele’s curly figure (also called Pommele appearance) resembles curly Maple with a partially formed bird’s eye. Boards that display this unique figuring are usually kept as slabs, but they can be missed at the African mills and, therefore, sawn into regular-sized boards. Because their beauty is lost on door and window manufacturers who value uniformity over uniqueness, wholesalers specializing in those industries easily give up these gorgeous boards for far less than they’re worth. If you’re looking for great alternatives to Genuine Mahogany, Utile and Sapele are both wonderful options.